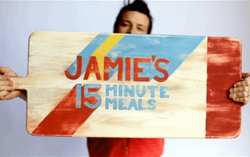 Jamie's 15-Minute Meals is a UK food lifestyle programme which aired on Channel 4 in 2012. In each half-hour episode, host Jamie Oliver creates two meals, with each meal taking 15 minutes to prepare. Season 1 premièred on 22 October 2012 and concluded with its series finale episode on 14 December 2012. A tie-in book of recipes was released on 27 September 2012. Jamie cooks chilli con carne meatballs, plus sticky kicking chicken, watermelon radish salad and crunchy noodles. On the menu are flashy fish stew, saffron sauce and garlic bread, plus seared Asian beef, best noodle salad and ginger dressing. Jamie makes crispy Camembert parcels, autumn salad and cranberry dip, plus golden chicken with braised greens and potato gratin. Jamie rustles up a beef stroganoff with fluffy rice and red onion and parsley pickle (625 calories). Later he makes Moroccan mussels with tapenade toasties and cucumber salad. Jamie makes his best fish baps, mushy peas and tartare sauce. Later he cooks mushroom farfalle with blue cheese and a hazelnut and apple salad. Jamie cooks lamb lollipops, curry sauce and rice and peas, plus prawn linguini and Sicilian shaved fennel salad..
On the menu this time is chicken dim sum, coconut buns, cucumber pickle and hoi sin sauce, plus crackin' crab briks, couscous salad and salsa. Jamie shows how to cook crispy duck and hoi sin lettuce parcels, and chicken cacciatore, spaghetti and smoky tomato sauce. This time Jamie rustles up Moroccan bream, couscous salad, pomegranate and harissa, and British burgers, shred salad, pickles and things. This time it's jerk pork, grilled corn and crunchy tortilla salad, plus minestrone, poached chicken and salsa verde. Jamie cooks Swedish meatballs, celeriac and spinach rice, plus pasta pesto, garlic and rosemary chicken. On the menu in this edition are green tea salmon, coconut rice and miso greens, plus modern greek salad, spinach, chickpea and feta parcels. Jamie rustles up pork steaks, Hungarian pepper sauce and rice, plus killer kedgeree, beans, greens and chilli yoghurt (474 calories). On the menu are rosemary chicken, grilled polenta and porcini tomato sauce, plus happy cow burgers, old-school coleslaw and corn on the cob. Jamie cooks sticky squid balls, grilled prawns and noodle broth (489 calories), plus sausage fusilli and creamy garden salad. On the menu is smoked salmon, Yorkshire pud, beets and asparagus, plus gorgeous Greek chicken, sweet pepper and pea couscous with tzatziki (683 calories). This time Jamie cooks glazed sizzling chops, sweet tomato and asparagus lasagnetti, plus mushroom soup, stilton, apple and walnut croutes. Jamie rustles up seared Asian tuna, coconut rice and jiggy jiggy greens, plus ricotta fritters, tomato sauce and courgette salad. This time the meal is spiced chicken, bacon, asparagus and spinach lentils, plus falafel wraps, grilled veg and salsa (602 calories). Jamie cooks grilled tuna, kinda Nicoise salad, Thai chicken laksa and mildly-spiced noodle squash broth (656 calories). This time it's fettuccine, smoked trout, asparagus and peas, and black bean beef burgers, noodles and pickle salad. On the menu is pork Marsala, porcini rice and spring greens (572 calories), plus koh samui salad, chilli tofu and Thai noodles. On the menu is crispy Parma pork, minted courgettes and brown rice, plus grilled mushroom sub, smoky pancetta, melted cheese and pears. Jamie cooks sizzling chicken fajitas, grilled peppers, salsa, rice and beans (616 calories), and prawn cocktail, king prawns and sundried pan bread (525 calories). On the menu is sizzling beef steak, hoi sin prawn and noodle bowls, mighty mackerel, and mixed tomato and quinoa salad. Jamie cooks up some steak, liver and bacon, bubble and squeak mash and red onion gravy, and Mexican tomato soup, chilli nachos, and veggie and feta sprinkles. Jamie makes glazed pork fillet, cajun-style pepper rice and barbecue sauce, and tapas bruschetta, and golden grilled sardines. On the menu this time is lamb kofte, pitta and greek salad (587 calories), and Keralan veggie curry, poppadoms, rice and minty yoghurt. Jamie cooks white fish tagine, with carrot, mint and clementine salad, plus Spicy Cajun chicken, smashed sweet potato and fresh corn salsa. On the menu in this episode are beef kofta curry, fluffy rice, beans and peas (706 calories), plus spring frittata, tomato toasts, watercress and pea salad. Jamie cooks chorizo and squid with greek-style couscous salad (634 calories), plus simple spaghetti, tomato, basil and creamy curd salad. Jamie rustles up lamb meatballs, chop salad and harissa yoghurt, plus incredibly delicious chicken salad. Jamie cooks crab bolognese with crunchy fennel salad, plus mexican BLT, chillies, guacamole and salad. On the menu this time is squid 'n' prawns spicy vegetable noodle broth, plus veggie chilli, crunchy tortilla and avocado salad. Jamie shows how to prepare in 15 minutes both Asian fish, miso noodles and crunchy veg, and ultimate pork tacos, spicy black beans and avocado garden salad. This time the two meals cooked up in a quarter of an hour are sausage gnocchi, warm kale and bean salad, plus Mexican chicken, wicked mole sauce, veg and rice. Jamie Oliver cooks Asian sea bass, sticky rice and dressed greens, plus chorizo carbonara and Catalan market salad.